"I can't see through the goggles," Carl said. "Should they be all fogged up like this?" "Don't worry," Bruce said. "Once you're outside and moving in back of Archie's car they'll clear right up." "We... approached the second most important ingredient in the record attempt: Archie. OK, that's enough. 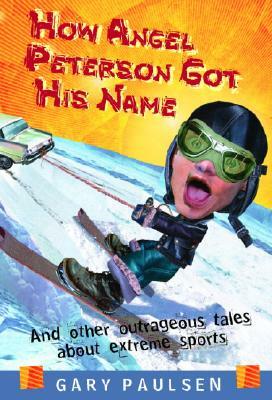 If you want to read something guaranteed to make you laugh, try How Angel Peterson Got His Name. Gary Paulsen! This one definitely sounds like a far cry from Hatchet :) I want to read it! Thanks for sharing. I love reading this one to my 8th graders. Many of them are already Paulsen fans, and this book usually hooks a few more. Oh, man, it just sounds so wrong. :) I like Gary Paulsen--I'll have to check this one out! Well, it IS different. I had forgotten how funny it was. Reviewing it, I kept laughing. Reviews like this one are why I follow this blog. Thanks for pointing out a great-sounding book.